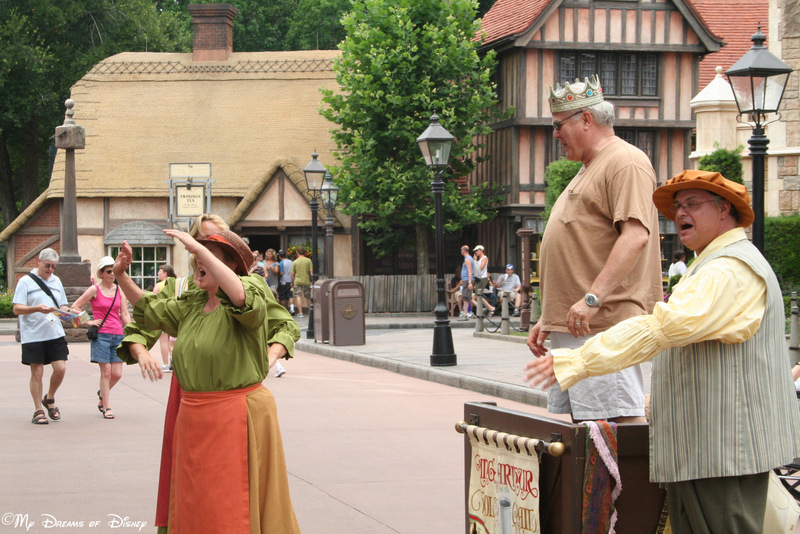 Some of the best things to do at Walt Disney World are to enjoy the street performers, and at Epcot’s World Showcase, there are several to enjoy in your trip around the world. In this picture, you see some of the players (along with a guest appearance) of the World Showcase Players. The guest appearance is playing the role of King Arthur, and this show is always a good time! In addition to the World Showcase Players, you can also check out Serveur Amusant in France, Sergio the Italian Clown Juggler in Italy, and Off Kilter in Canada! Almost a month later here I am finally doing what my uncle asked me to do, write this blog! My intention is to tell you all about my Top Ten favorite places to eat in Disney and in the process tell you why (after all, that is the part that counts!) When he first asked me to write this I figured it would be easy, ha… that was a joke. Everything that Disney World has to offer is all fantastic so it simply comes down to a personal opinion. So, after putting a lot of thought into my ten choices, I finally came up with this list. Enjoy! Two years ago I found myself sitting in this restaurant with my uncle, aunt and cousin. Being the loving and generous family they are, I was given the opportunity to tag along on their trip. As a way to show me what Disney really is, they wanted me to eat at the fancy schmancy places. Given that fact, Captain’s Grille is my top choice because this is where my experience began… where my little girl dream of feeling the Disney wonder came true all because my aunt and uncle were willing to bring someone like me along with them. This one is a no brainer…. Tigger is there!! Duh! Again, another no brainer, PRINCESSES! The food offered here is also fantastic. You may be thinking that it won’t taste as good because it’s not American, but you will be pleasantly surprised as soon as you take your first bite. WARNING: Make sure you are not wet prior to going inside because you WILL freeze (and you won’t be as pretty for your princess picture). Also, if you are married/dating… beware because your prince may be admiring all the princesses instead of you, the true princess. Despite the occasional long line trying to get in, it is worth it if you love a GOOD cinnamon bun! Everyone will love this place… Not only is the food served family style, but the actual restaurant rotates at a slow but noticeable speed… now that’s “totally wicked!”. I highly recommend this place to eat for breakfast. When we went, I remember waking up fairly early to make it here for the reservation. For those of you that don’t know me, I love my sleep (especially since I was in college at the time, sleep is a college kid’s best friend) but this place got me motivated to get up. Not only does a morning reservation give you motivation, it also starts your day off right because the Disney magic starts early. I must admit, I really liked this place because of their entertainment. While you are eating in a well decorated place, there are four men playing cowbells, something that you can’t see everyday at McDonald’s. Now tell me, what American doesn’t like a place that serves good BBQ? Not only do they offer BBQ but you and your family have the chance to dance with some of Disney’s characters! In case this list is intimidating because I have mainly listed table service restaurants (places that might cost a little more ;)), I figured I’d throw in a counter service one. If you are on the go and want a quick bite to eat, Columbia Harbour House would be my top pick. I have eaten here more than once and each time have had great service and great food. Ice Cream! Ice Cream! Ice Cream! While watching the night parade and fireworks, Plaza Ice Cream Parlor makes for a tasty, cool-down, treat!